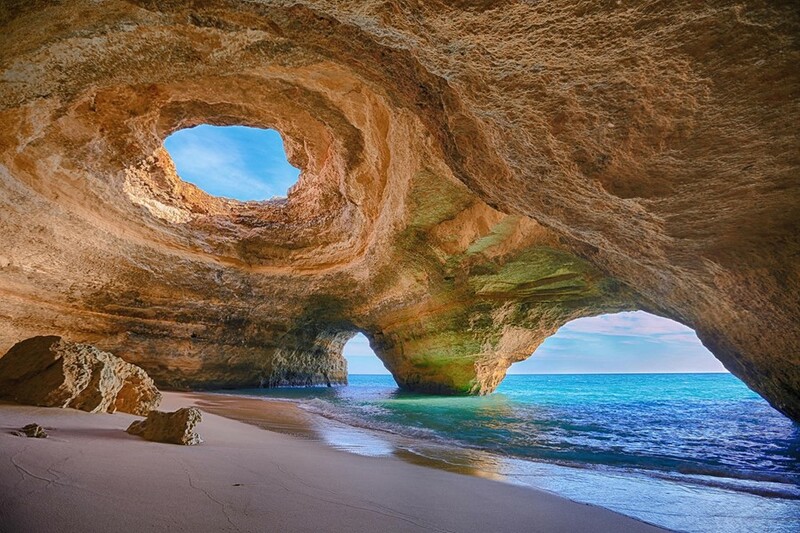 The World’s Most Beautiful Cave? Tucked away in the folds of southern Portugal’s rugged coastline lies one of the most beautiful natural cathedrals on the planet. Carved by the pounding waves that sweep in from the vast Atlantic Ocean, the coastal area near Benagil is home to a series of intricate caves, sea stacks and hidden beaches. Some of the caves are almost completely dark and submerged, while others are too small to squeeze inside – but the most famous is huge, airy and lit by an ever-changing palette of colours that come from the sky, the ocean, the sun and the rocks. 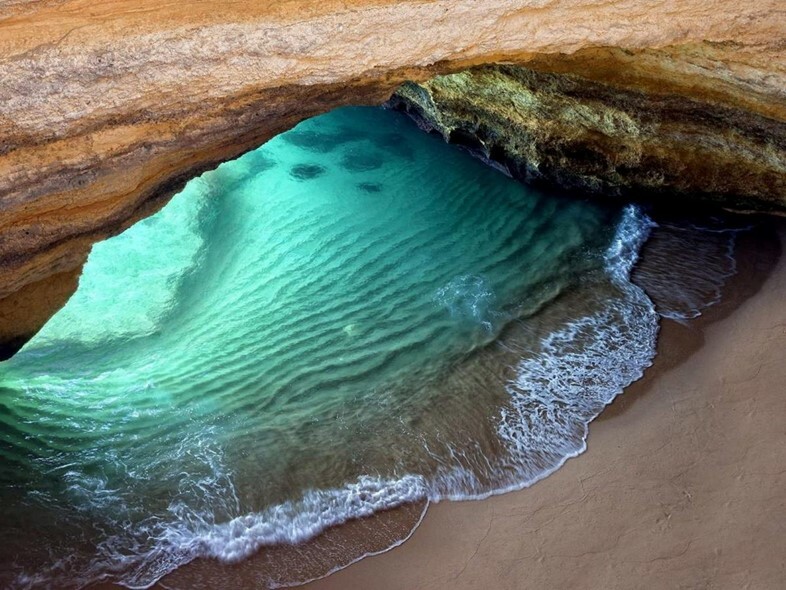 The Benagil Sea Cave, as it’s most commonly known, is just east of the small town of Benagil on the Algarve. With its own ‘indoor’ beach, two sea-facing holes and a further circular skylight eroded through its ceiling, it’s a favourite with photographers and tours – see our tips below on avoiding the crowds. Like much of the Algarve, the coast around Benagil is made up of Miocene limestone sitting on much older rocks created in the Mesozoic era, when dinosaurs ruled the Earth. The Algarve Basin between Cabo de São Vicente and Faro was part of a region caught in the epicentre when the supercontinent of Pangea began to split up, and warm, shallow seas slowly crept in. Over time, the limestone built up, with the layers that make up the Benagil Sea Cave forming about 20 million years ago. Like other karst formations around the world, the cliffs surrounding Benagil have been subjected to a series of weathering processes – from rainwater coursing through the soft limestone to waves washing up and around harder rocks to form stacks. Eventually, caves like Benagil will likely collapse completely, as the Earth’s unending geological evolution continues. Plenty of boat tours departing from all over the Algarve take you to the Benagil Sea Cave and other points along the coast. The advantage is seeing these myriad other caves and secret inlets, but you won’t have the cave to yourself. For that, try going for sunrise by kayak from the nearby beach at Benagil. As ever, be careful and pay close attention to tide times, the weather forecast and local advice.